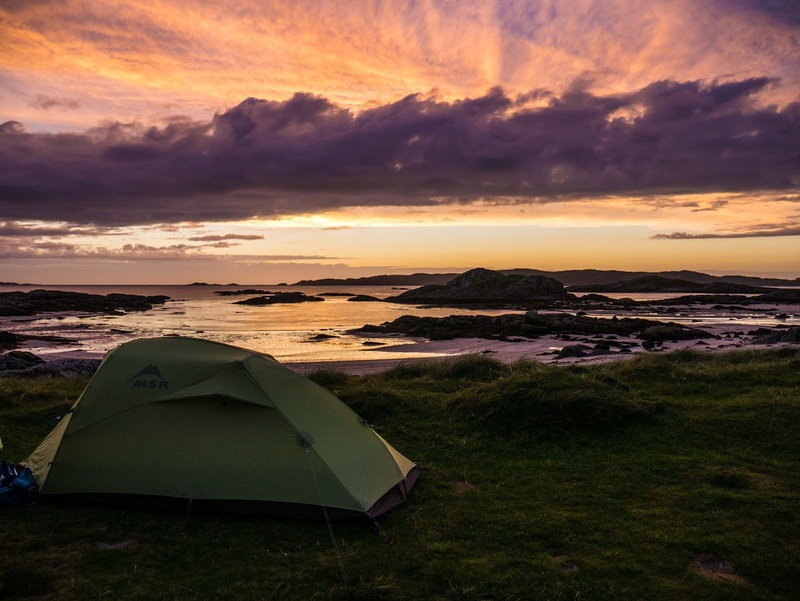 An ideal camping spot on the West coast of Mull. 2013 model shown. Sold as a backcountry tent for two, the Nook packs a punch at 1300g (300g shaved off the 2013 model shown above). The tent is an inner first design using two poles with a freestanding option if a walking pole is used to supplement the existing poles. The footprint is remarkably small which makes it very easy to use on even the smallest of pitches which can be very useful if the terrain is difficult. The inner first design, although a pain at times in heavy rain, means the outer fabric is easy to tension resulting in a tent that is very stable in high winds (the aerodynamic shape of the tent also contributes to this). MSR have opted to use a fabric which is a good compromise between weight and durability which means that the tent is not the lightest in its class but can be expected to last a long time. I have had my model for three and a half years, used it extensively, and have yet to see any signs of wear. The hydrostatic head ratings for the tent are lower than other competing tents but has been done intentionally by MSR. Fabrics have a weigh-off between hydrostatic head capacity and durability and in this case MSR opted for durability. I have personally tested the tent in some heavy Scottish rain storms and have yet to see water make its way into the tent. One of my favourite features, however, is its remarkable ability to ventilate resulting in very little condensation build up after a night in the tent. The tent does, however, have some shortcomings. One of the major faults I have with the tent is the size, it is sold as a two person tent but actually fitting two people in the tent is quite a challenge. If the tent is shared between two grown men they would preferably have to be good friends as it is a snug fit. Both occupants need to have narrow sleeping mats for this to work as it is not possible to fit two Exped mats in the tent. There is also very little space in the porch meaning only one bag can be placed there. To help with the space issues, MSR have added a small pole in the roof of the tent which allows both occupants to be sat in the tent, a rare feature in a two pole tent design. Another gripe with the tent is the exclusion of guy lines. Although the tent is reasonably stable without guy ropes, they become necessary when the tent is used in any form of strong wind, so the exclusion of simple guy lines in a tent costing over £350 seems like a bit of an oversight. In summary, a fantastic tent with regards to performance. The tent is probably most useful as a 'heavy' one man tent with additional space rather than a two person tent. It is easy to put up, light, wind resistant and ventilates well. Things we don’t like: Space for two people, lack of guy ropes.